W&L’s SonoKlect Presents Trio ZBR in Concert Trio ZBR will present a program that expands the definition of virtuosity in music. 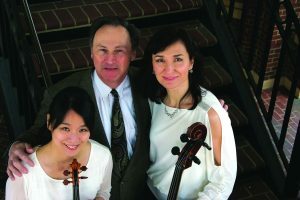 Washington and Lee University’s SonoKlect will present Trio ZBR in concert on Feb. 10 at 8 p.m. in Wilson Concert Hall. The concert is free and open to the public and no tickets are required. Trio ZBR will present a program that expands the definition of virtuosity in music. The program contains three works written specifically for the trio and, although all the pieces are deeply versed in the classical tradition, they each resist categorization and are quite novel in terms of formal structure, without ever losing an ever-present direct emotional impact. The ensemble includes Grammy-winning flutist Molly Alicia Barth, a founding member of the new music sextet Eighth Blackbird; cellist Jeffrey Zeigler, who spent eight seasons with the renowned Kronos Quartet; and pianist David Riley, a SonoKlect regular who has been mesmerizing audiences at many of North America’s most prestigious venues for more than two decades. For more information, visit wlu.edu/lenfest-center.